The RP 240 is the latest pistol-grip tool in the RIDGID Compact Press Tool family. 15% smaller and 10% lighter than its predecessor (RP 210-B), this lightweight, low profile design, is ergonomically designed to help you easily work in the most difficult jobsite conditions. 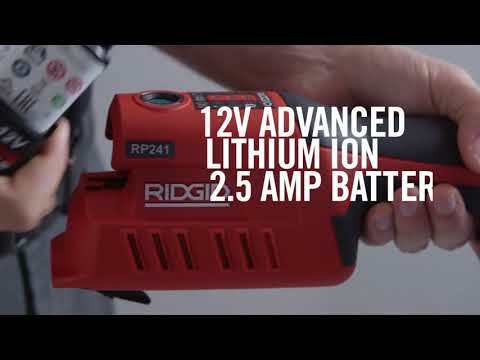 The RP 240 also offers many unique features, like Bluetooth® connectivity (connecting the tool to the RIDGID Link app), which allows users to track numbers of cycles, battery information, and much more. Smaller Tool - The RP 240 tool is 15% smaller and 10% lighter than the previous RIDGID Compact pistol-grip tools. Better Weight Balance - While the tool is 10% lighter than its predecessor, with the new compact design and better balance, the tool will feel even lighter than that. Multiple Size & System - The RIDGID RP 240 connects copper & (stainless) steel systems up to 1-1/4” (35 mm) and PEX & Multilayer systems up to 1-1/2” (32 mm). Bluetooth Connectivity - Connect to your tool through the free RIDGID Link app (available on App Store and Google Play) on your smartphone and/or tablet, and access important tool information like cycle count, tool status, battery life, daily press cycles etc. New 12V Lithium-Ion Battery - Every RP 240 Kit includes two 12V Advanced Lithium Ion Batteries, each providing more than 140 crimps* per charge. *Over 150 crimps per charge on 1-1/4” (22mm) copper fittings—smaller sizes may get more crimps. Model Design Pistol-grip design for tool balance & ergonomics. RP 240 Press Tool is rated 4.3 out of 5 by 10. Rated 5 out of 5 by Tomasmont from The product is excellent I'm very pleased with the product, would gladly recommend to all. Rated 1 out of 5 by AWRooter from Reliability Issue Less than a year ago we ordered an RP 240 compact press and we loved it. A month ago we are cutting out a commercial water heater and getting ready to save time by pressing the fittings, and the press won't run. Yellow light is on saying that we are locked out and the manual says that that means we've gone over 32000 cycles. Now we are stuck on a job where we've cut out the old water heater have the new one in place we cant install with the fittings we brought. We rent a press tool from our local supply house and get the job done. Again we've only had this for less than a year there is no way that we have used it for 32000 cycles, and it never gave us the warning flashes at 30,000. We send the press in for service. A month later and multiple calls trying to find out when we'll get it back, we're told that the board has gone bad on the new tool. Problem is the board is on back order and we don't know when we're gonna get it back. I've always had a high opinion of Ridgid tools, but this is not acceptable. Rated 5 out of 5 by Plumco from The Bluetooth capability is helpful! Great Tool! I have the larger press gun RP 340. The RP 240 Compact, fits in tight areas! Tool is not heavy, and gives a great press! It took time for me to make the switch, from sweating copper. It's a great investment, and worth every penny! Huge time saver, and no leaks, if installed correctly. Rated 3 out of 5 by Webb from Slow, not as easy to use as other ridgid pro-press products This is our 6th Pro press. It is the slowest yet. We still have the RP210, which is able to have the jaws rotate 90% more and is twice as fast on the press. We own it, but we don't feel it is an improvement as we were led to believe. Rated 5 out of 5 by Kona from After about 30 years in the industry, if I had to solder again, I'd quit plumbing. I've been using the same 340 and 210 tools for about 12 years. I had a bad 1/2" copper jaw that put a strain on the 210 so I picked up the new 240. The 210 still works just fine but the thought of having it go down in the middle of a project worried me. (I was looking for an excuse to buy a new toy) These tools are awesome and last a long time. Good work Ridgid. Rated 5 out of 5 by MaxV from New and Improved! New design improvements including significantly smaller and lighter profile than the RP 210. Cool wireless connectivity features allow you to see the last location of the tool and the remaining service life. Rated 5 out of 5 by Twstdty from Good tool Always wanted one could not justify buying cause of price till I needed one love it. Rated 5 out of 5 by ARL1 from Pistol style fits into tight spots The RP-240 works great so far. Compact and easy to maneuver in tight spots. Looking forward to my Zoomlock jaws to arrive!